Display images and 3D objects in Full HD with incredible detail for the whole class to see. Thanks to a large A3 shooting area, two full pages from a textbook can be displayed. Smooth video streaming is achieved with impressive clarity and without motion blur at 30 frames per second. Thanks to a 16 x digital zoom and built-in LED light, even intricate detail can be seen. Ideal for science lessons, minute objects can be displayed on a large screen thanks to a microscope attachment. Live images and video content, including that stored on a SD card, can be output to multiple displays thanks to parallel video output. Thanks to split-screen functionality, teachers can present two pieces of content side-by-side to help highlight teaching points, such as plant and animal growth. 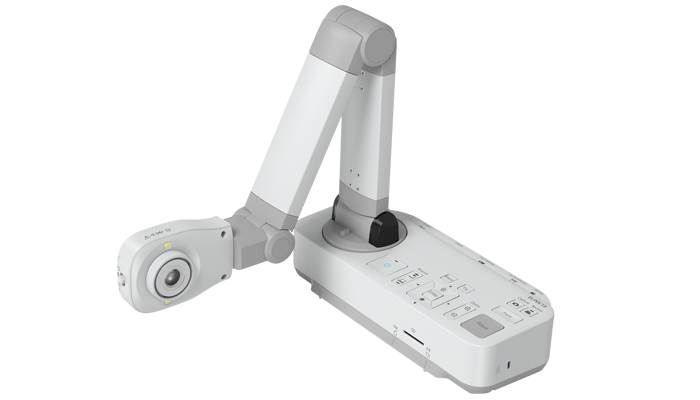 Teachers can maintain student engagement by operating the document camera directly from the projected image at the front of the classroom, including starting and stopping video recordings. A lightweight and portable design and included soft carry case makes it easy to move between classrooms. With a Kensington lock and security bar, schools and education establishments can have added peace of mind when the camera is unattended or not in use.